I’ve been giving product and samples away for 3 years but I was never able to measure whether any of my sales came from one of those promotional efforts… until now! I’ve had a custom order of quilled cards from a fellow member of the Etsy for Animals (EFA) team of members who support animal charities! One member of EFA collects handmade donations from EFA team members for the Thrift Shop at the Alaskan SPCA (AKSPCA). Back when I first joined EFA, I had donated a small number of cards. Since then, I have refocused my efforts on the Southern Ontario Animal Rescue (SOAR), so all of my charity cards in my shop have proceeds going only to SOAR. I decided that, when I changed my shop name from “Ensorcelled Minds” to “Fairy Cardmaker”, part of starting down the path of rebranding myself was to return to my roots: EFA. I have started to participate more on the EFA team challenge blog, which also helps populate my shop with items helping SOAR. So, I also decided to donate more product. 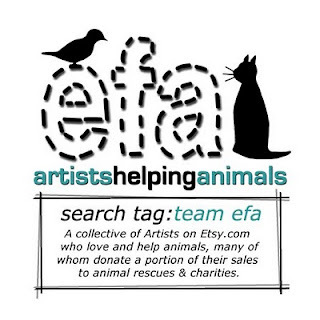 Now, most of my past donations have been by way of the EFA team store on Etsy and in small promotional items (usually hang tags) to go in swag bags for events. It has been over a year since I have seen calls go out for swag bags and the EFA store closed due to the time intensive administrative strain. I went through the oldest messages in my old Ensorcelled Minds shop and found one about sending cards to the AKSPCA thrift shop. So, I then went through my inventory from Ensorcelled Minds and decided how much of it to donate to the AKSPCA. I picked out about 6 cards. Among them was a card with a quilled cat and the caption, “A new friend”. It was one of my first cards and they first one with proceeds going to SOAR. I made it as an adoption card but it never sold. Andrea of EveryDogsDelight on Etsy, who collects the items for the AKSPCA, loved it. She orderd 6 quilled cards from me! The quilled cat design I made years ago from seeing a stamp. 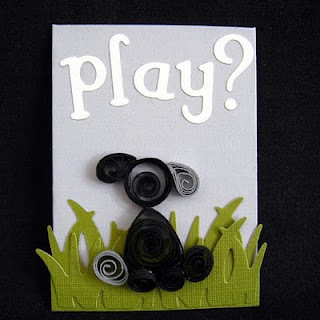 As soon as I saw the shape of the stamp, I knew I could reproduce it with paper quilling. The dog was a tougher design. I’m sure I have said before how I struggle with dogs in art. The main reason I struggle is that there are SO MANY breeds and, therefore, so many shapes and sizes. How can I pick just one and hope that it will sell? I decided to suspend reality for a moment and return to cartoon. If I were to quill a cartoon-shaped dog, what would the iconic shape be? Well, droopy ears was the first thought – possibly inspired by Snoopy, Charlie Brown’s dog from the popular comic strip by Charles Shultz. I came up with this dog on an ATC, which also sat idle in my shop for many moons but finally actually sold. (Sold to Hawaii actually – it was quite exiting!). I will be sending more cards northward to the AKSPCA in the future. Since it costs a lot to ship so far, I usually wait until I have gathered a handful to donate. Even if I never saw a return on my product given away, I usually give it away for a good cause. That’s not going to stop! It’s just nice to see a “cause” and effect! Chrismas Cards for Charity 2010 - con't.